Every time I’m in an Asian country (outside of the Philippines of course), I tend to pack at least one cutesy outfit. This is it! Doesn’t get any cute than this! I mean, have you seen how big my ribbon necklace is??!! Galit sa ribbon! I find this outfit kind of preppy. It must be because of the huge ribbon and my Keds. Keds are God’s gift for travelers who seek comfort. Out of all my shoes for traveling, these are by far the most comfortable I’ve worn. This marks the end of my travel posts! Until my next trip abroad! Whenever I travel, I try my best to bring just a bag or 2 and a few pair of shoes. The challenge is always coming up with outfits that match these bags and shoes without looking too similar. Challenge accepted! Is it possible for you to let me know the name of this Balenciaga bag..I have been searching online for this..and I need to have this beauty!! If you don’t mind me asking,how many balenciagas do you have? =) i love the outfit! This looks very cute and comfy. This is so cute! I find this so cute because this is probably the first time that I saw you wearing your rubber shoes. So cute! very cute outfit camille…love it! absolutely you look teen. (^_^) so cute, pero any outfit you wear naman mukha ka parin pong teen. hehehe. Haha! I’m forever young :) Thanks Jhaycee! Sorry I haven’t have time to comment on your blog. I love this outfit and I really really really love the shoes! You’re so gorgeous! All is forgiven! :) Haha! Thanks Kira! You’re beautiful and fashionable! I like your face, its good for you to become a model. I love the dress, its not so much dazzling. aww. you look so lovely in that outfit!!! (yes, I say this with an exclamation mark) It doesn’t look like your in your mid-20’s already. love your bracelets btw. any tips on wearing a skirt during windy seasons? or should i not wear one at all? You are soo chic!! Thanks for enlightening me with new ideas yet again! Love this get up! Who designed your blog layout? 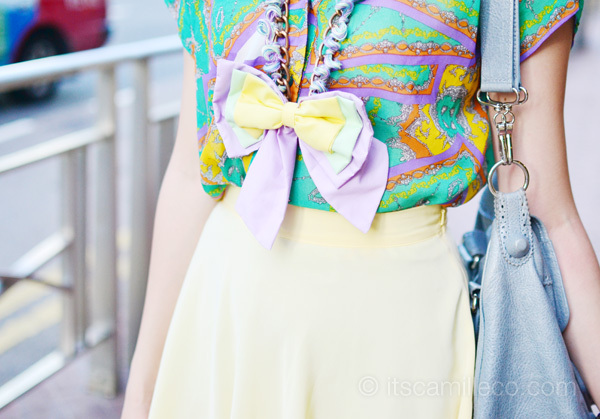 I love this outfit and blog layout! OMG! I really love you style of fashion! ;) Gorgeous! It was nice seeing you in person at Glorietta, Nail It. With the purple turned pink nail polish? I’m a spy too! How could you look gorgeous out of this teen-y outfit? :D Vibrant! I love this outfit,specially the shirt!The necklace is so cute and you’re so beautiful. Soooo cute! I’m wondering what camera do you use? Ay akala ko po binenta niyo na yung D3100 mo kasi balak mo bumili ng D7000? and how do you make your pictures look pretty kahit d3100 lang yung gamit mo, do you still edit it? Love love love this outfit, Ms Camille!! you do look like a teenager! =D I love the ribbon necklace and the bracelet and also the Keds shoes! it really looks comfy! I don’t even know haha :) Sorry! I wish I have a walk-in closet! :) I’m scared to count how many I have haha! I really adore the bag! it fits all the outfit that you are wearing! I love the mixing of colors! you’re the best talaga! You better wear those cutesy outfits more often while you can still get away with it. haha! You still have 6 more years pa naman. haha! Beyond 30, that would be unacceptable. Chos! Mommy Camille with her daughter/son wearing this outfit…. I can’t imagine! My first reaction to this look is “CUTE!” haha :D Stay safe! Galit sa ribbon! The best! :) Cute super! Absolutely adorable! And I totally agree that Keds are super comfy! On another note, you’re truly an aspiring fashionista and I love you Camille! You’ve kept me wondering what your occupation is because you seem to be living the life that every girl would love to be in:) Please share? Thanks Reigne! Challenging but worth every kg saved! What a cute outfit! It’s perfect for the sunny weather there. You’ll have loads of fun! How young are you again Ms. Camille? Haha! I really like this outfit, like something a 14-year-old like me can wear! Do you think so too? :p I’ll always love you and your Balenciaga! Yes, you really look like a teenager!